Teens: How Would You Like to Spend Your Summer at Randall’s Island? Get creative this summer at the Bronx Museum’s The People Make the Park Teen Summer Program at Randall’s Island! 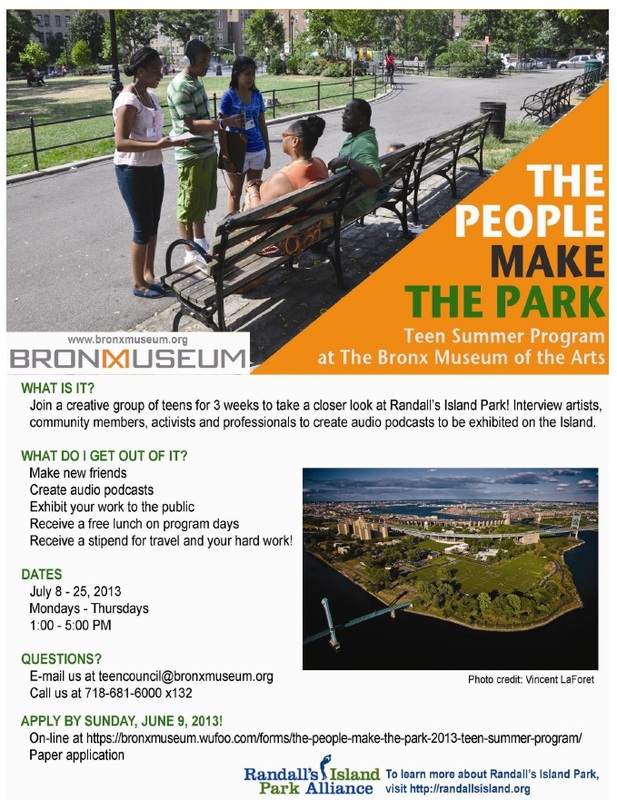 This is your chance to spend July with teens just like you, interviewing community members, park staff, artists, activists and professionals in order to create audio podcasts that will be placed on exhibit at Randall’s Island Park. Additionally, there will be free lunches on program days and a stipend for your travel and hard work. Think of the people you could meet and uncharted experiences to be had — sounds like a winning college application essay! Check out The People Make the Park 2012’s Tumblr for a better idea of the program. Applications are due by Sunday, June 9, 2013 – so apply today. You must be entering the 10th, 11th or 12th grade in the fall of 2013. The program will be held from July 8 – 26, 2013, Mondays through Thursday, 1 PM to 5 PM. This entry was posted in Blog, East Harlem, Manhattan Valley/West Side, Mott Haven, Opportunities and tagged Bronx Museum, creativity, exhibit, High school, podcats, Randall's Island, summer, teens, The People Make The Park. Bookmark the permalink.